When the Lit-Soc race was heating up much like the Chennai weather, came the much anticipated ‘Drams’. After a lot of deliberation and delay, this event was finally held on 27th and 28th February. 8 hostels participated and competed against each, with as many as 35 Lit-Soc points for the winner. Out of these eight hostels, Sarayu, Sharav, Ganga and Narmad finished in the top four spots. Here’s what the different hostels presented and how they fared. Saras’s play, a dramedy , ‘Bank on Me’ managed to hold its own on the account of some strong performances by it’s lead roles. The plot revolves around the everyday life of the Smiths. Mr. Robert Smith is an ambitious , powerful and cunning banker who realises that he does not love his wife as much as he used to. He plots to divorce his wife, Mrs. Cecilia Smith, by publicly shaming her and making her ineligible to receive her fair share of the couple’s joint wealth, with the assistance of his trustworthy man-servant Mr Jones . The script, an original piece by Suryanarayana ‘Silicon’ Raju, who also plays Mr. Smith with great finesse, follows Mr. Smith’s eventually successful skullduggery. Raju won the Best Actor award for his excellent portrayal of Mr Smith. 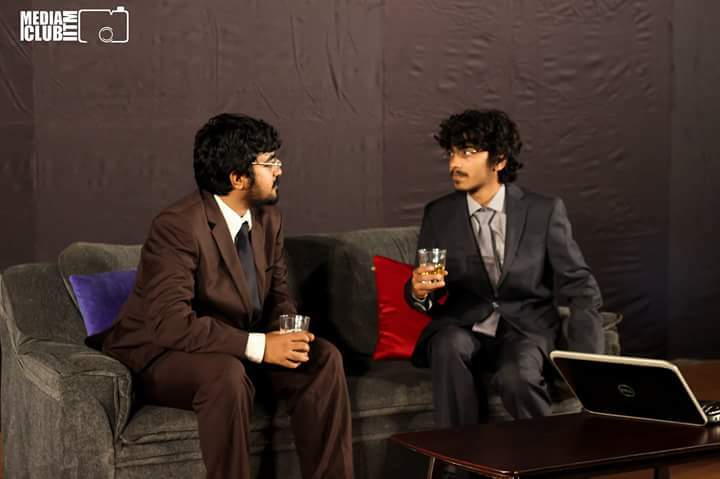 Shreyashee Roy’s portrayal of Mrs Smith and Bhargav’s portrayal of the mute Mr. Jones were certainly noteworthy. 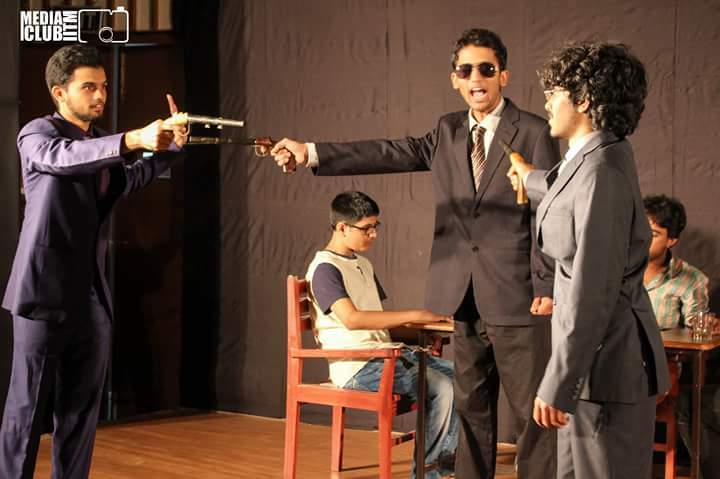 Jamuna Hostel performed Three Blind Mice, an adaption of Agatha Christie’s Mousetrap – the most produced play in theatre history. The story begins with the radio broadcast of a murder and the owner of the Monskwell Hotel preparing for his hotel’s opening night. The guests start rolling in one by one and finally a Scotland Yard police officer bolts in saying that the murderer’s next target was the hotel. A murder at the hotel thickens the plot and with every guest being equally likely of being the murderer makes sure that the officer has his task cut out. Suspicions were on all characters, namely Mr.Metcalf, Mr.Ralston, Mr.Paravacini, Mr.Casewell and Mr.Wren till the very end. The driving of the suspense and the revelation of the twist drew gasps from the crowd present. An excellent directorial work from Shalin Doshi resulted in him winning the Best Director award. However, Jamuna failed to place in the top 4.
was high on entertainment value and full of laughs and saw the actors breaking the proverbial fourth wall by reaching out to the audience. It was a play typical of its name with the actors clad in suits playing hitman attempting to kill each other in a Mexican Standoff. With a game of poker in the background, what followed was a hilarious take on the 3 confused hitmen and their respective idiosyncrasies. The production, music and action came together brilliantly, resulting in Ganga securing the 3rd spot in the competition. Sharavati was the final hostel on Day 1 of dramatics and they did not disappoint. Their play, ‘The Class’, as the name suggests, was set in a self-defence class. The play followed 4 girls and a guy and their respective time in the class. The first girl Pooja, who was attending her first class, was a nervous wreck and perplexed about what to wear. Next came the foul-mouthed tom-boy Nikita who kept spurning the interests of Shreyas and beat anyone who angered her in the slightest. Next came in Shiela who had eyes only for Shreyas. Finally there was Terri, the delicate beauty queen who tried to be a matchmaker of sorts. What followed was a unique class with people falling down, kicking each other and even bleeding on stage. With several self-referential jokes the play was high on entertainment value and scored well with the judge as Sharavati came 2nd and further extended their lead on the Lit-Soc table. Narmada started the proceedings on Day 2. They performed ‘The Whole Shebang’, written by Rich Orloff. This play asks the question, “What if the entire universe was just some nerd’s science project?”. Atul Shreyas played the role of the ‘student’ striving for a “Master of the Universe” degree giving an oral presentation on an unusual thesis about the creation of the heavens and the earth. The three professors on the review board had contrasting attitude which worked well in tandem for the cause of the play. The trio of the quirky, dismissive and supportive professors interrogated him and his smartly planted visual aides, John and Jane Doe. Comedy ensues when they realise that the aids picked up were the relatives of John and Jane Doe, who were house sitting for the couple and were not so ideal for our student’s project. The general problems in every person’s life surfaced resulting in our beloved student’s project receiving a C+ grade. It was a play that had the audience at the edge of their seats till the end and an impressive acting performance by Atul led Narmada to the 4th spot. Sarayu’s play, a comedy, ‘Twinkly Helter-Skelter’, was an adaptation of the popular podcast ‘Cabin Pressure’, centred around the crew of a chartered airplane – two pilots, Vanessa and Mary, Carolyn, the owner and her idiot son/steward Arthur. Scheduled for a trip to Helsinki, hilarity ensues when ‘Mr Arthur Milliner’, the unknown passenger, turns out to be a cleverly crafted pseudonym for Arthur, who booked the trip as an excuse to reunite his mother with her estranged sister Ruth as a birthday present. Tempers run high as long-standing family feuds resurface and everyone attempts to satisfy their own petty agendas. Predictably, this does not end well. The play was well executed, with appropriate British humour at intervals, and went down well with the audience. The acting, comedic script and production all coalesced beautifully into a play which was deserving of its 1st place, while Ramya Vijayram who played the role of Vanessa won the award for Best Actress. Pampa performed ‘Dumb, Dumber and Gum Resin’ , written by Nick Zagone. This play was about the three wise men’s younger brothers. Everyone assumes they are smart because their brothers are smart, but in reality, they are extremely stupid. Herod gives them a task to find and kill the newborn King, Akhmed, born to the adulterer Mary Jane, and George. A comical take on the night of Christ’s birth and how the three brothers of the Magi, namely Bronze, Incense and gum resin manage to make a meal of the task set by Herod. 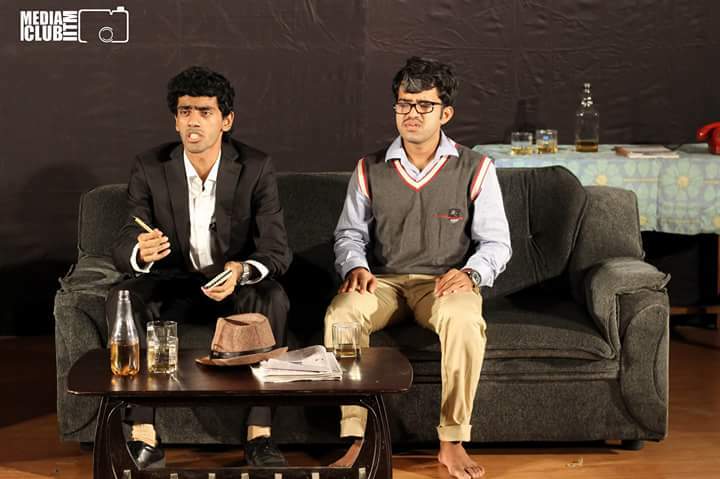 The play was directed by Akash Ramdas and though it was presented as Pampa’s play, it had actors from both the freshie hostels, Mahanadhi and Pampa. The dancing sign-off was a highlight and the intentional stupidity throughout the play was what made it a joy to watch. It was great to see the freshies put up a play and enjoy it to the fullest. With Pampa the Lit-Soc dramatics for the year 2015-16 came to a close. 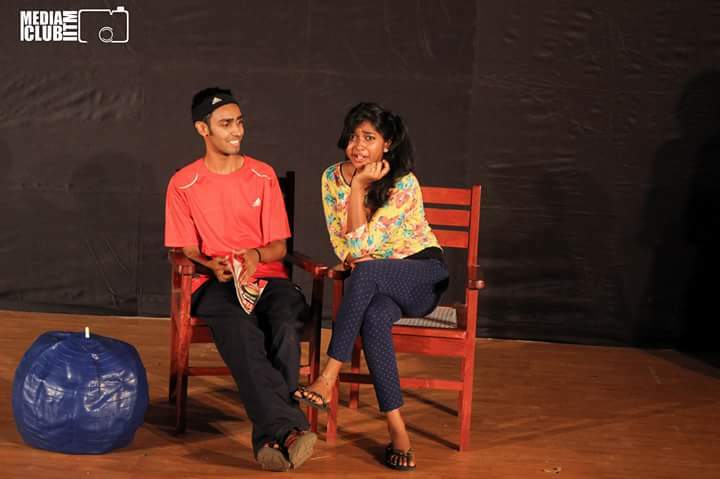 It was one full surprises with Sarayu despite being a freshman hostel with not much experience winning the event and have set the bar for next years’ dramatics. Sharav pulled further away in the Lit-Soc with Ganga, Tapti and Alak left to play catch-up.